Homologues of the ligand binding domain of the wild-type bacterial aspartate receptor, Tar. Methyl-accepting chemotaxis proteins (MCPs) are a family of bacterial receptors that mediate chemotaxis to diverse signals, responding to changes in the concentration of attractants and repellents in the environment by altering swimming behaviour [(PUBMED:16359703)]. Environmental diversity gives rise to diversity in bacterial signalling receptors, and consequently there are many genes encoding MCPs [(PUBMED:17299051)]. For example, there are four well-characterised MCPs found in Escherichia coli: Tar (taxis towards aspartate and maltose, away from nickel and cobalt), Tsr (taxis towards serine, away from leucine, indole and weak acids), Trg (taxis towards galactose and ribose) and Tap (taxis towards dipeptides). MCPs share similar topology and signalling mechanisms. MCPs either bind ligands directly or interact with ligand-binding proteins, transducing the signal to downstream signalling proteins in the cytoplasm. MCPs undergo two covalent modifications: deamidation and reversible methylation at a number of glutamate residues. Attractants increase the level of methylation, while repellents decrease it. The methyl groups are added by the methyl-transferase cheR and are removed by the methylesterase cheB. 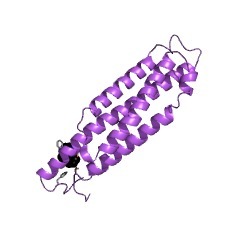 Most MCPs are homodimers that contain the following organisation: an N-terminal signal sequence that acts as a transmembrane domain in the mature protein; a poorly-conserved periplasmic receptor (ligand-binding) domain; a second transmembrane domain; and a highly-conserved C-terminal cytoplasmic domain that interacts with downstream signalling components. 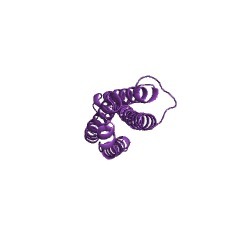 The C-terminal domain contains the glycosylated glutamate residues. 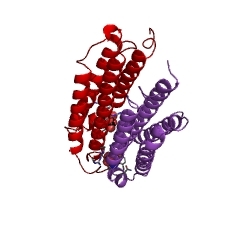 This entry represents the ligand-binding domain found in a number of methyl-accepting chemotaxis receptors, such as E.coli Tar (taxis to aspartate and repellents), which is a receptor for the attractant L-aspartate [(PUBMED:1660187), (PUBMED:27292793)]. It is a homodimeric receptor that contains an N-terminal periplasmic ligand binding domain, a transmembrane region, a HAMP domain and a C-terminal cytosolic signaling domain [(PUBMED:21689529)]. 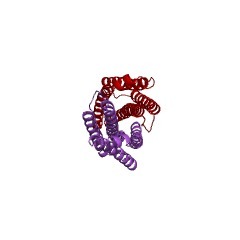 There are 2064 TarH domains in 2063 proteins in SMART's nrdb database. Taxonomic distribution of proteins containing TarH domain. This tree includes only several representative species. The complete taxonomic breakdown of all proteins with TarH domain is also avaliable. Click on the protein counts, or double click on taxonomic names to display all proteins containing TarH domain in the selected taxonomic class. Transmembrane signalling and the aspartate receptor. BACKGROUND: The aspartate receptor is a transmembrane protein that mediates bacterial chemotaxis. The structures of the periplasmic ligand-binding domain reveal a dimer, each subunit with four alpha-helix bundles, with aspartate binding to one of two sites at the subunit interface. 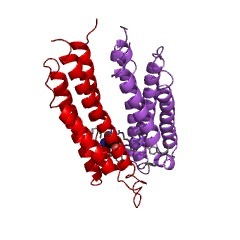 The transmembrane regions of the receptor were not included in these structures. 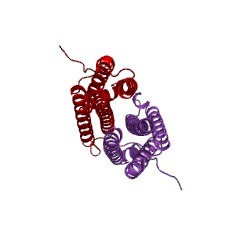 RESULTS: To investigate the structure of the transmembrane region, we have made a mutant protein with two cross-links, restraining the subunit-subunit interface on both sides of the membrane, and have made an energy-minimized model of the transmembrane region. We demonstrate that the transmembrane helices form a coiled coil which extends from the periplasmic subunit through the membrane. 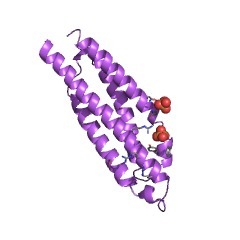 We have constructed a model of the ligand-binding domains with the amino-terminal transmembrane helices. CONCLUSIONS: We draw three conclusions from our model. 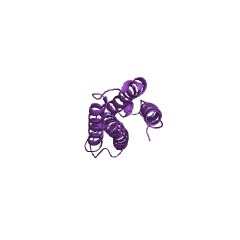 Firstly, the interface between receptor subunits in the intact receptor consists of an uninterrupted coiled coil. 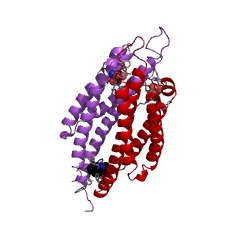 Secondly, this structure rules out several postulated mechanisms of signalling. Thirdly, side chain packing constraints within the helices dictate that local structural changes must be small, but are propagated over a long distance rather than being dissipated locally. Low energy changes in the conformation of side chains are a probable mechanism of signal transduction in the aspartate receptor. Three-dimensional structures of the ligand-binding domain of the bacterial aspartate receptor with and without a ligand. The three-dimensional structure of an active, disulfide cross-linked dimer of the ligand-binding domain of the Salmonella typhimurium aspartate receptor and that of an aspartate complex have been determined by x-ray crystallographic methods at 2.4 and 2.0 angstrom (A) resolution, respectively. 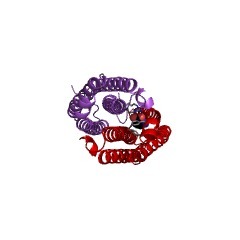 A single subunit is a four-alpha-helix bundle with two long amino-terminal and carboxyl-terminal helices and two shorter helices that form a cylinder 20 A in diameter and more than 70 A long. The two subunits in the disulfide-bonded dimer are related by a crystallographic twofold axis in the apo structure, but by a noncrystallographic twofold axis in the aspartate complex structure. 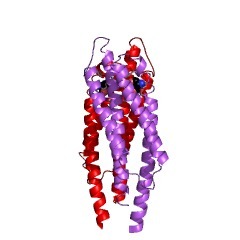 The latter structure reveals that the ligand binding site is located more than 60 A from the presumed membrane surface and is at the interface of the two subunits. Aspartate binds between two alpha helices from one subunit and one alpha helix from the other in a highly charged pocket formed by three arginines. The comparison of the apo and aspartate complex structures shows only small structural changes in the individual subunits, except for one loop region that is disordered, but the subunits appear to change orientation relative to each other. 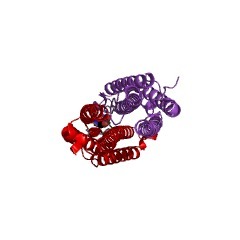 The structures of the two forms of this protein provide a step toward understanding the mechanisms of transmembrane signaling. This information is based on mapping of SMART genomic protein database to KEGG orthologous groups. Percentage points are related to the number of proteins with TarH domain which could be assigned to a KEGG orthologous group, and not all proteins containing TarH domain. Please note that proteins can be included in multiple pathways, ie. the numbers above will not always add up to 100%.